Although sister-chromatid exchange (SCE) analysis is recognized as an indicator of exposure to DNA-damaging agents, the results of these analyses have been confounded by the use of bromodeoxyuridine (BrdUrd) to differentially label the sister chromatids. Not only does BrdUrd itself induce SCE, it also modulates the frequency of SCE induced by certain DNA-damaging agents. In order to examine this effect of BrdUrd on SCE frequency, an indirect method which lends itself to measurements both with and without BrdUrd was employed. Human teratocarcinoma-derived (P3) cells were exposed to ethyl methanesulfonate (EMS) and cultured with increasing concentrations of BrdUrd for lengths of time corresponding to one, two, and three generations of cell growth. At each time point, the distribution of nuclei among the phases of the cell-cycle and cell growth were evaluated for each concentration and chemical. A statistical model was employed which tested both for the main effects of chemicals and culture times and for interactions between these factors. Both EMS and BrdUrd significantly affected the percentages of nuclei within the cell-cycle. Exposure to EMS resulted in decreases in the percentages of nuclei in G0 + G1 and increases in the G2 + M compartment. Exposure to BrdUrd affected the size of the G0 + G1 compartment as well as the percentage of S-phase nuclei. 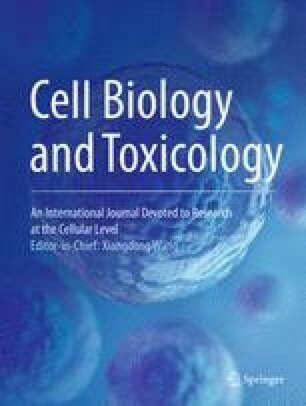 Cell growth was reduced as a consequence of increasing EMS concentration and as a function of BrdUrd concentration; the effects of these chemicals were more readily apparent at the later time points. Most importantly, for both the cell-cycle kinetics data and the cell growth data, no evidence of an interaction between the effects of EMS and the effects of BrdUrd was detected statistically. These results may be interpreted to mean that while both EMS and BrdUrd affect the induction of SCE, under the conditions of this experiment, the effects are additive rather than interactive.